Last week, we looked an amazing example of large-scale Meissen porcelain sculpture. This time, we’ll look at another beautiful work of Meissen, this two-handled urn. This sizable object has a great presence (it’s about a foot tall). What immediately draws attention is the beautifully painted decoration. 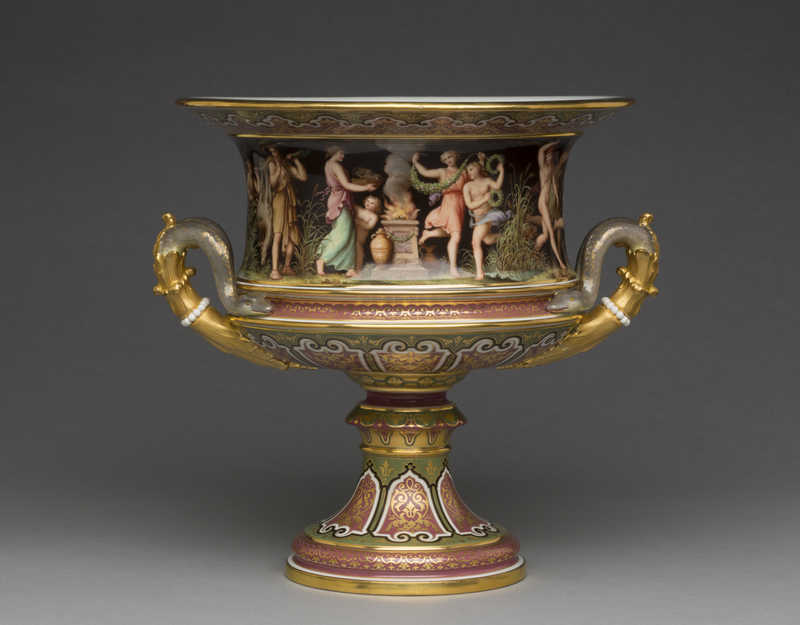 The base and rim are painted in a Renaissance revival-style panel with purple-pink and light olive green tones highlighted with the white of the porcelain and shiny gilding. And then there is the main frieze, which shows an ancient Greek myth called the Calydonian Boar Hunt. The story of the Calydonian boar hunt was told and retold during antiquity–most famously in the Roman poet Ovid’s Metamorphoses. When King Oeneus of Calydon failed to honor the goddess Diana with offerings, she released a terrifying boar on his land. The king’s son, Meleager, assembled a group of renowned warriors to slay the beast. Several of the huntsmen were killed or maimed before Meleager finally defeated the boar. Meleager can be seen here in the middle with other hunters and their dogs. On the other side are women offering a boar head to Diana at a sacrificial altar. The myth was well-known to artists who studied ancient art, for the Calydonian boar hunt was one of the common narratives used on ancient Roman sacarphagi. Myths that focused on death and triumph over death—particularly those that focused on a hero rising to the occasion—were extremely popular for decorating a final resting place. Still, the subject matter is on the unusual side, so it made me go looking for more uses of the myth. I did find a porcelain vase that came up for auction in 2007 that has the same composition on it. It looks as though the same design was used for both vases. The vase that was sold in 2007, however, is not marked as Meissen. Our urn is definitely marked as Meissen; on the bottom are crossed swords in blue under the glaze. What does this mean? What I think has happened here is that an accomplished porcelain painting studio has used the same design on two different porcelain blanks. One of the blanks came from the Meissen factory, the other from another maker. As if this extravagant and high-quality painted decoration wasn’t enough, the urn has another interesting element to it: the use of snakes for the handles. A number of Meissen vase shapes used snake handles in the nineteenth century. Some examples include this one with a floral decoration and this pair in bright yellow-green. They were such a popular design element that Meissen has a specific term for it—schlangevasen—literally “snake vases”! 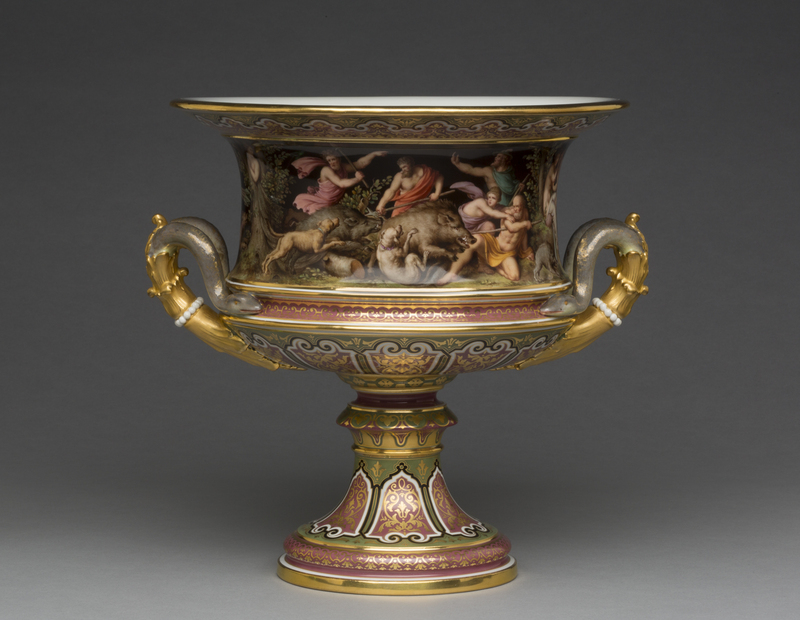 This entry was posted in Art, Curatorial and tagged European art, meissen, Mythology, porcelain, urn. Bookmark the permalink.